Thum! Kaun Aata Hai? : LR-SAM - Why it's Worth the Wait! One of the reasons why the Navy isn't as worried as the defense journos that INS Kolkata was commissioned with 48 empty cells of vertically launched Long Range Surface to Air Missiles (LR-SAM) that are to shield it against an attack by anti-shipping missiles, is because the missile system, when it's finally installed, would give the warship the best protection money can buy in the world today! You can cross check that claim with any Navy man - he will agree! What is confounding is the missile hasn't been tested even once! The confidence reposed in the missile system stems from its pedigree. It's basically an Israeli missile. Former Navy Chief, Admiral Arun Prakash gives an interesting insight in today's Business Standard as to how the missile came to be the most coveted AD weapon system on Indian warships. 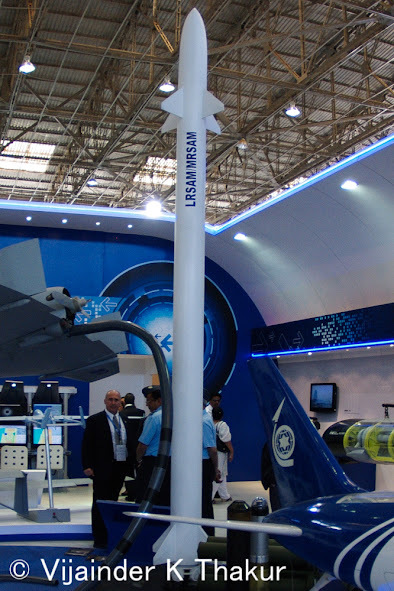 He recalls how the Israeli Navy, on behalf of its defense industry, offered the Indian Navy the long-range SAM with "superior anti-aircraft and anti-missile defense capabilities" in 2004-05. "The 'cherry on the cake' was to be the new multi-function phased-array radar that accompanied it. There was no altruism behind this offer; the small numbers required by the Israelis made the project economically unviable for them, and there were not many nations they could trust with such sensitive technology. Driving a hard bargain, the IN obtained Israeli agreement for joint development and co-production of systems. "Showing eminent good sense and pragmatism, the DRDO leadership agreed to the navy's proposal for a path-breaking tripartite collaborative arrangement with the Israelis for the development of the LR-SAM. The funding as well as manpower liabilities were shared by the IN and DRDO. The project, involving DRDO scientists, naval engineers and the defense-industry has rendered tremendous benefits to all three participants and, notwithstanding development delays, will bring the IN to front rank of navies technologically." DRDO Chief, Avinash Chander, in a recent interview gave his own insight into the project. He said, "The Armed forces had actually tried to buy such a system from abroad, but nothing was really available that would come with satisfactory terms. And that is how we got into a joint venture with Israel, the system had to be developed ab initio. So there were issues with respect to radar development, issues with respect to the actuation system as well which was initially supposed to be pneumatic but then had to be changed to electromechanical. Then there was the two pulse motor which was being done for the first time and that got into certain combustion stability problems. But the good news is that all those problems have now been overcome. We launched a massive program on the rocket motor and today we have a motor which is stable and will be tested shortly."